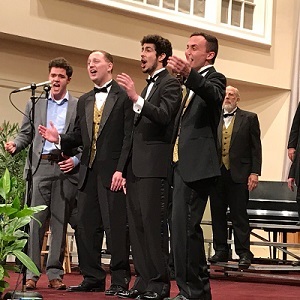 On Saturday, April 14th, the Chordbusters are hosting an a cappella contest for youth quartets. This contest is open to anyone 25 and under, and the winning quartet will receive a prize of $400. have four members, all of whom will be 25 and under on April 14th. pre-register for the contest by Friday, April 13th. sign in at the venue upon arrival, before the contest begins. sing one song a cappella (no instruments) live in front of the contest audience. This contest will take place at First Baptist Church (of Columbia) immediately following the Chordbusters show Tunes From Around The Dial, which begins at 7 P.M. and will likely end around 9 P.M. General admission for the contest/afterglow is $2, but performers/competitors will not need to purchase tickets. Since it will be part of the afterglow, the spirit of the contest should be relaxed fun and friendly competition. The winner will be determined by audience vote, and the $400 prize will be awarded to the winning quartet at the end of the afterglow. To pre-register a quartet, please contact Jim Hillbrick at (360)-632-9548 or jrhillbr@hotmail.com.